The 2014 edition of Wimbledon has the potential to be one of the most open Grand Slams for a long time. With niggling doubts surrounding the traditional big four, the established second tier players sensing weakness and the emergence of a new generation of players, there is an ever growing list of players for whom arguments can be made for challenging for the title. In this article, I look at 17 players that will be seeded and will be in with a chance of either winning Wimbledon or at least troubling the top players. Prediction: The champion in 2011 and a losing finalist last year, it is tough to see Djokovic not going well again. While the rest of the big four have all suffered surprising losses in slams over the past year or so, having reached at least the semi-final in 15 of his last 16 slams. His return game and break point creation is world class, his first and second serves are both above average, but the only slight weakness is an average break point conversion and save rates. In his last three defeats on grass against Murray, Del Potro and Federer, he created a total of 22 break points, but converted just five of them. Against these top players, he needs to be more clinical, particularly given that he was broken 12 times in those three matches. Unless he takes his opportunities, he could find the very best a step too far on this surface. Prediction: The King of Clay has never been entirely at home on grass, but his quality and desire to win this tournament has seen him lift the title on two occasions, winning in for the first time in an epic encounter against Roger Federer. However, he has struggled in recent years, losing to Lukas Rosol and Steve Darcis in the last two years, and was disappointing (albeit justifiably so given the circumstances) in defeat against Dustin Brown in Halle. While only slightly above average behind his first serve, it is his excellent second serve statistics combined with a solid return game that is key to his chances at Wimbledon. As is the case every year, it is dangerous to write Nadal off, but there are certainly better grass court players in the draw. 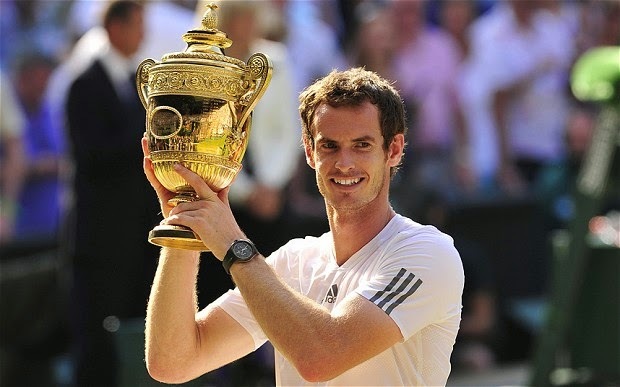 Prediction: The defending champion comes to Wimbledon on a 13-match winning run on those hallowed courts, but there are questions facing him in 2014. He is yet to reach a final since his return from surgery late last year, although a good run at Roland Garros should have restored some of the confidence and match fitness that was lacking early in the season. A curious defeat to Radek Stepanek at Queen's should give him time to recover after the French Open and he is sure to be one of the favourites for this title. Arguably the best grass court player in the world, he will fancy his chances against any player in the draw. Prediction: Arguably the greatest grass court player there has ever been. His career statistics are simply phenomenal - world class first and second serve, return, break point creation, limiting break points on his own serve, few break points. 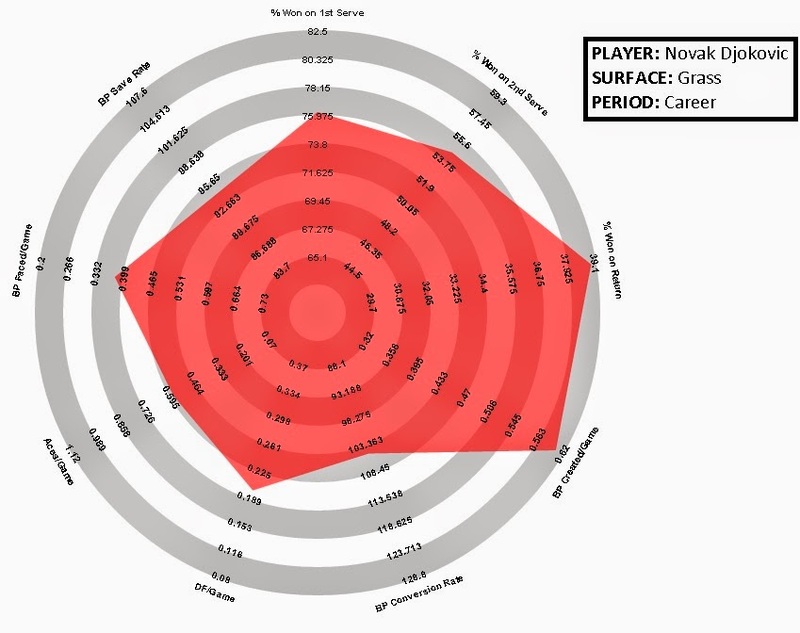 The only weakness is that his performance on break point has been rather average, which has become more noticeable as the other facets of his game have declined slightly in recent years. He will have been hurt by his defeat to Stakhovsky last year and with just two semi-finals in his last seven slams, it is tempting to write him off. However, if he is going to have one final hurrah, it will be on the grass at Wimbledon. Prediction: His only warm-up event on grass ended in a semi-final defeat to Grigor Dimitrov after victories against the injured pair of Marinko Matosevic and Marcos Baghdatis. On grass, he has just one career final and is yet to beat a top-20 player in four attempts. Despite winning his first Grand Slam title in Australia, he has struggled since then, and combined with the health scare that has seen him miss training this week, it would be a major surprise to see him go far in this tournament. He is arguably the player that the big four would most like to see in their quarter from the 5-8 seeds. Prediction: One of just six players in the draw to have reached a Wimbledon final, he is always dangerous at Wimbledon. It has taken either a top-10 player or an inspired Gulbis to beat him on his last four visits here and with the questionable form of the top players, combined with a lack of obvious challengers from below, he might fancy his chances. He has very good first and second serve figures, plus he is above average on return, which combines to make him a very tough opponent. There may be some concerns over his recent form, having been disappointing at Queen's and surprisingly under-par against Gulbis in Paris, but if his game is firing, he has a real chance to go far here. Certainly the player that the big four will want to avoid in the 5-8 seeding bracket. Prediction: In the last four years, David Ferrer has been beaten at Wimbledon by Murray, Del Potro, Soderling and Tsonga. In other words, he only tend to be beaten by the elite. He has two grass court titles to his name as well, so it is strange that he is seemingly so underrated on the surface. He has an excellent return game, which leads to plenty of break points, plus he defends his second serve relatively well. His performance on break points could be better and he struggles against the very best players, but if he finds himself in a weak section of the draw, there is no reason he cannot do very well and at least match his best results at Wimbledon. Prediction: Often tipped to be a threat on grass with his booming serve, Raonic is yet to show any sign that he has the game to succeed at Wimbledon. In his last few tournaments on grass, he has lost to Peter Gojowczyk, Igor Sijsling and Ivan Dodig - all players that he should be beating with ease if he wants to challenge. 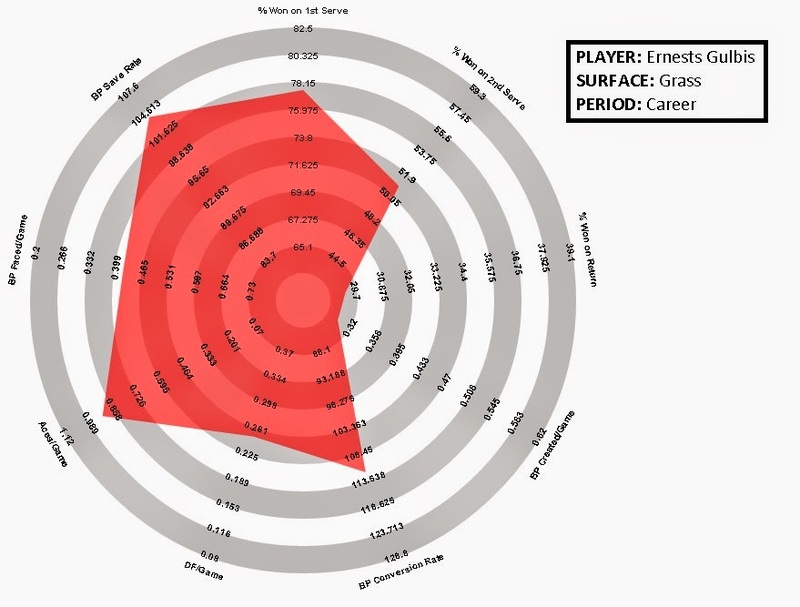 While he does win plenty of points behind his serve, his return game is as bad as any in the top 100 and his lack of movement is badly shown up on grass. He under-performs when down a break point, which, combined with his inability to break back, means that he struggles if he goes behind in a set. Another player that the big four would happily take from the 5-8 seed bracket. 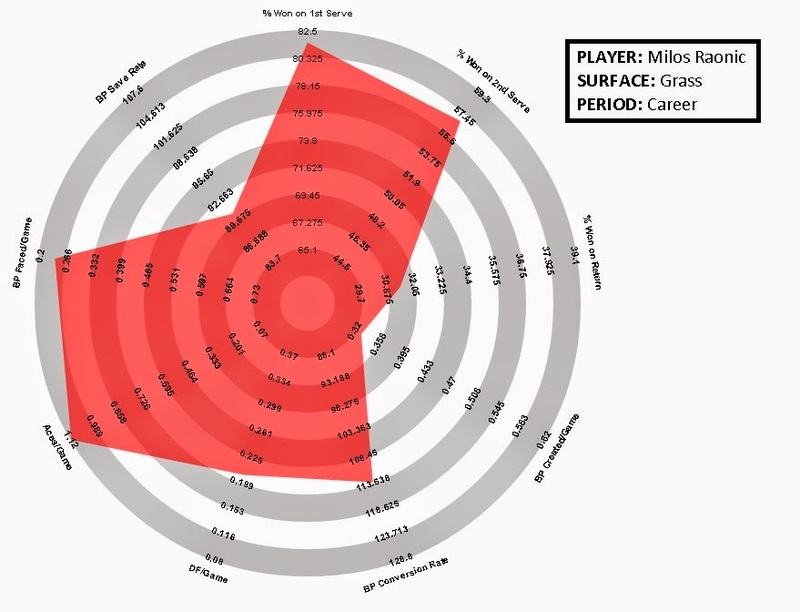 Prediction: Kei Nishikori is a wonderfully gifted shot-maker, but his body has so often let him down. 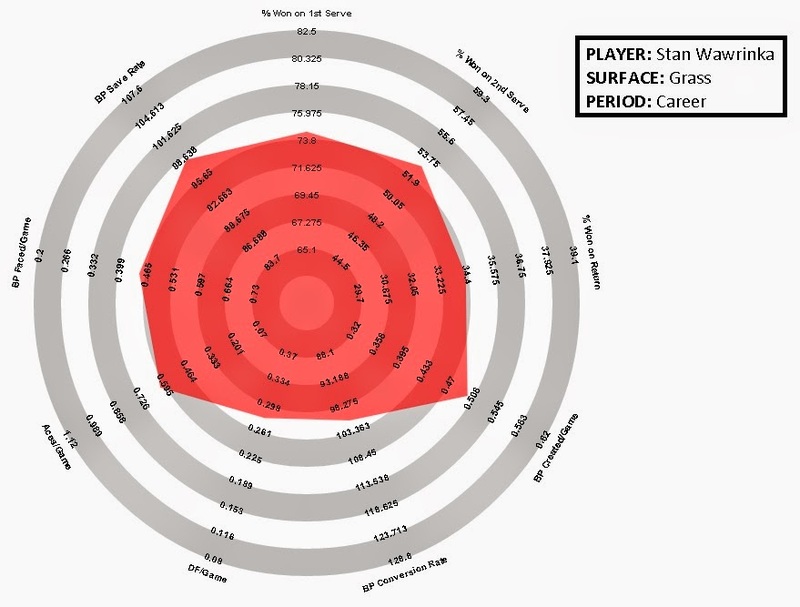 On grass, he has struggled with his serve, winning significantly below average points behind his first serve. He is a very good returner, but all too often he squanders leads or has to fight to work his way back into sets. The lack of cheap points on serve also means that he finds himself involved in plenty of long rallies, which doesn't help his fragile body. He will be a tough player to beat and it will take a real fight, but it is tough to see him lasting a fortnight and the top players should have plenty of joy against his weak serve. Prediction: The champion at Queen's is always a player to watch out for at Wimbledon and Dimitrov is no exception. He played well all week, although he was aided by a Lopez choke in the final, particularly on match point in the second set. Despite that, he served impeccably through the week, but will need to find plenty of first serves if he is to challenge at Wimbledon given his very poor second serve performance. He is also well below average on the big points, which is something that he will need to change when it comes to playing the best players where opportunities may be limited. He is a talented player, but it is tough not to feel that this might be a year or so too early for him to be a serious contender. Prediction: The enigmatic Latvian is always tough to predict. On his day, capable of competing with the very best, but just as likely to throw in a poor performance. He comes into Wimbledon on the back of his best ever Grand Slam performance, but with the exception of one win over Berdych a couple of years ago, he has rarely shown much on the grass. His serve is fractionally above average, but his return game on grass is dismal and he struggles to create break point opportunities. He is actually very solid on the big points and his break point save rate is right up there with the very best, which will help keep him in sets given his inability to earn breaks of his own. He is arguably playing the best tennis of his career, but while there were signs in the past of his ability on other surfaces, they have not been there on grass. 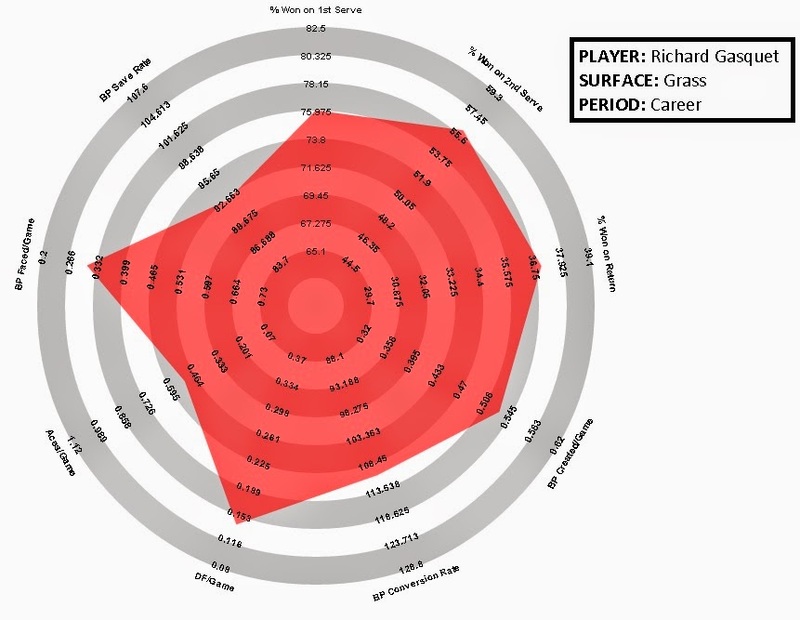 Prediction: Richard Gasquet is a player that tends to go as far as his seeding suggests that he should and no further. Based on that, we should expect him to reach the second week, which seems realistic. He has a very solid all-round game, but his fragility when down break point will always cost him when it comes to playing against the top players. There are fitness concerns ahead of this tournament, but if he is in reasonable shape, he has the ability to push the real contenders, if not actually beat them. 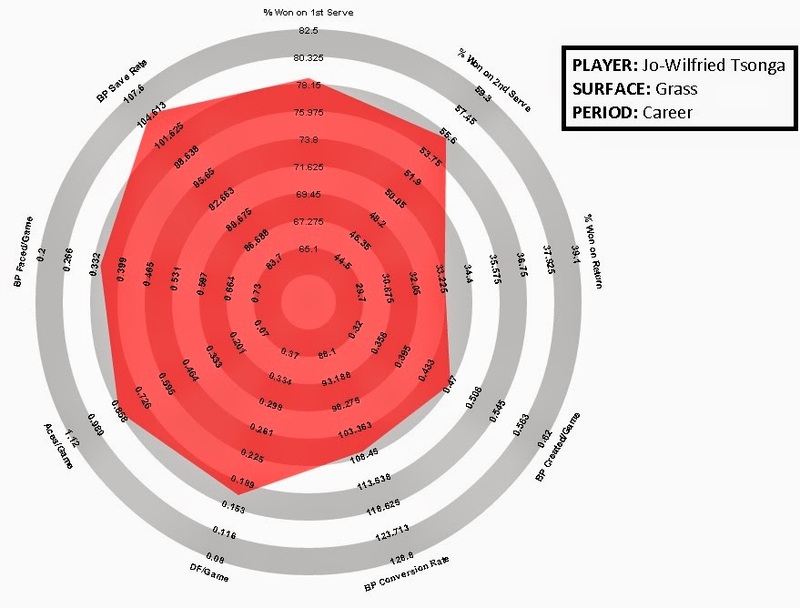 Prediction: Over his career, Jo-Wilfried Tsonga has been one of the most solid and consistent grass court performers, reaching two semi-finals at Wimbledon and it generally takes one of the elite players to beat him. 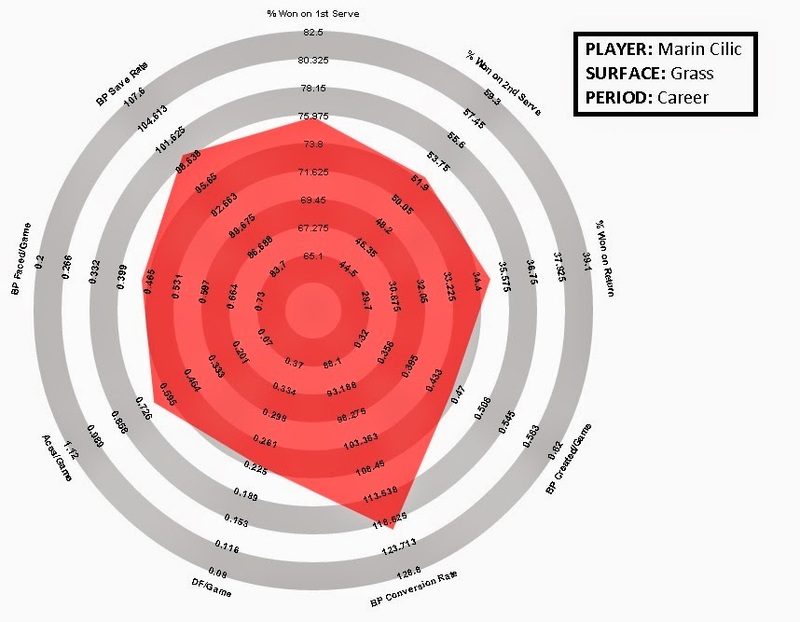 As the radar suggests, there are few weaknesses in his game, but his recent form coming into this tournament is rather worrying and suggests that he could be on the decline. If his serve is working well, he has the potential to outperforming his seeding here, but he will have to significantly up his game from recent outings. That is a big if and this tournament could give us a real insight as to whether Tsonga is a shadow of his former self. Prediction: He was the surprise of last year's tournament as he reached the semi-final and put up a fight against the eventual winner, Andy Murray. However, before we get too carried away, it is important to remember that he faced just one top-35 player to reach that stage as the draw opened up for him. 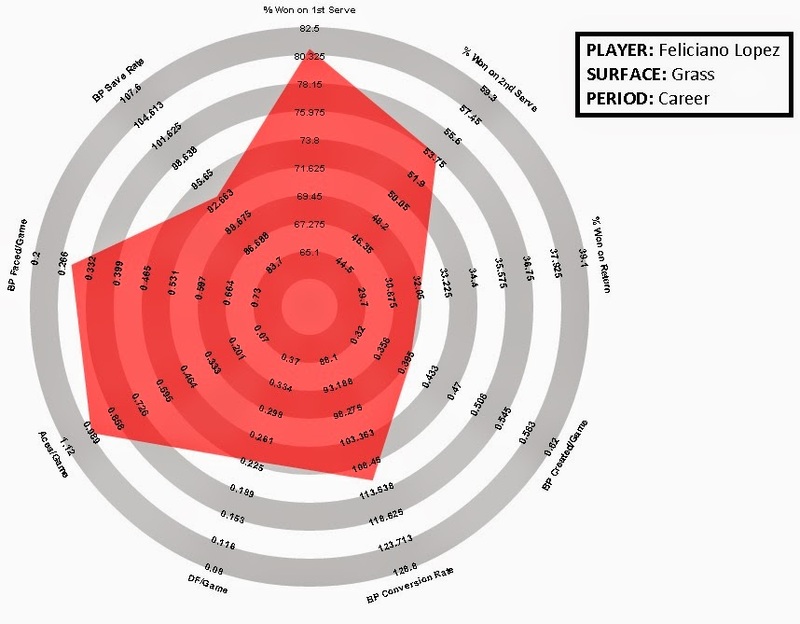 His first serve is his major weapon, but he throws in plenty of double faults and has yet to prove himself on return. A poor defeat in Halle against Pierre-Hugues Herbert summed up a pretty dismal year and while he will be hoping that a return to Wimbledon will turn things around, there is little to suggest that will be the case. A decent grass court player, but nothing more. Prediction: Last year, Fernando Verdasco came as close as anyone to derailing Andy Murray's title run. The Spaniard led by two sets to nil and had multiple break points in the fourth set to take what could have been a decisive lead. 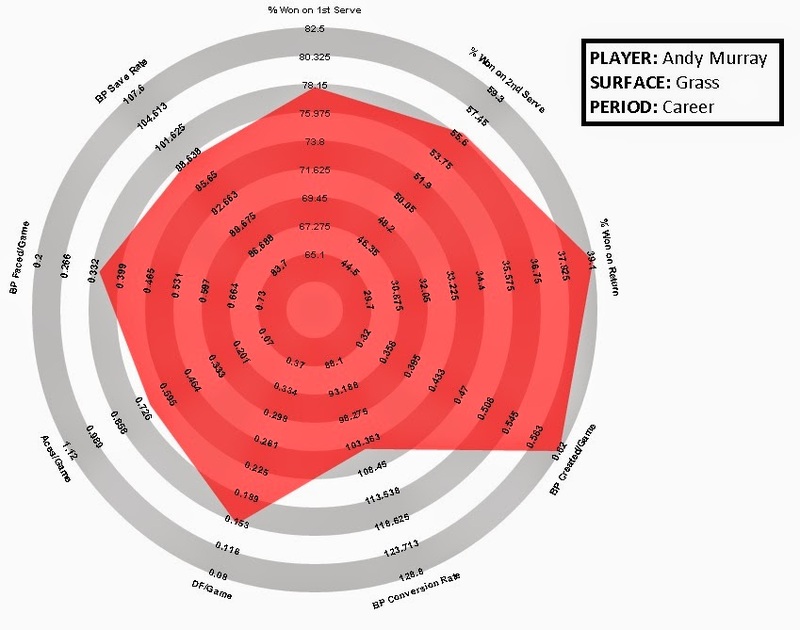 It was his best performance at Wimbledon to date and, while he is not going to challenge for the title, the radar suggests that he is a solid grass court player and is perfectly capable of seriously worrying the real contenders. 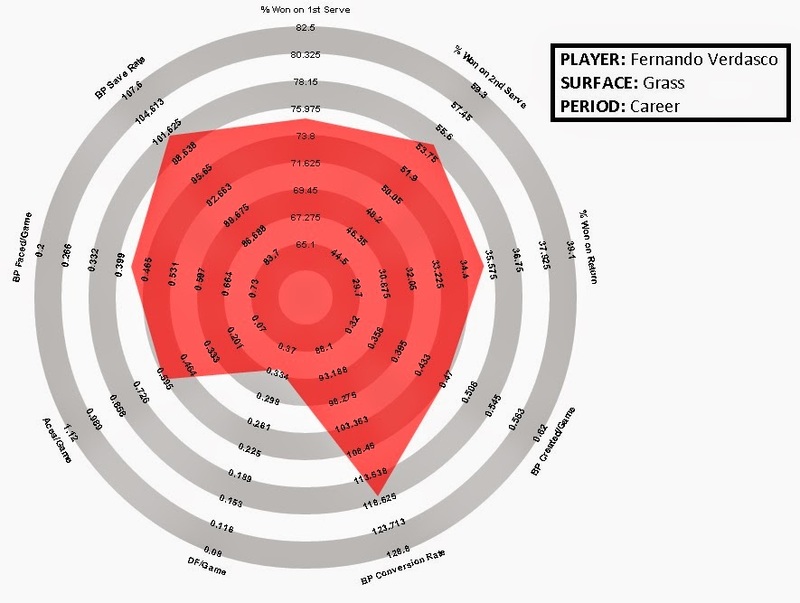 Prediction: On grass, Feliciano Lopez is one of the most difficult players to break. His big lefty serve and excellent volleying ability causes plenty of difficulties for opponents and limits the number of break points that he faces, which, given his relatively poor break point save rate, is probably a relief. 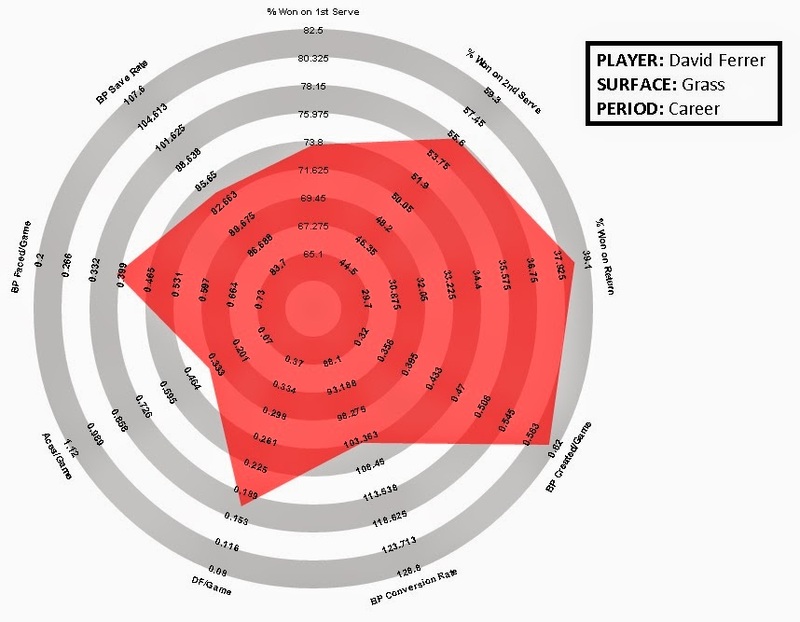 As with many big servers, his return game is somewhat lacking, but he is an experienced grass court player and his 10-10 record against top-20 players demonstrates, he is a dangerous opponent on this surface. He is full of confidence after a run to the final at Queen's - a title that he really should have won having had a match point in the second set and being up a break in the third. This summed up his problem though - he has a tendency to struggle under pressure, which could restrict the damage that he can do on the big stage at Wimbledon. Prediction: Back-to-back finals at Queen's show that Marin Cilic is perfectly at home on the grass. While there are no outstanding facets of his game, there are also no clear weaknesses either. He is strong on the break points, which stands him in good stead at crucial points of the match. His defeat to Matosevic at Queen's last week is slightly concerning, although he admitted that he had not prepared enough on grass, which should be rectified come Wimbledon. He certainly does not have the game to win the tournament, but he will be a tricky opponent for any of the players just below the elite level. Just a brief section on understanding the player stat radars. 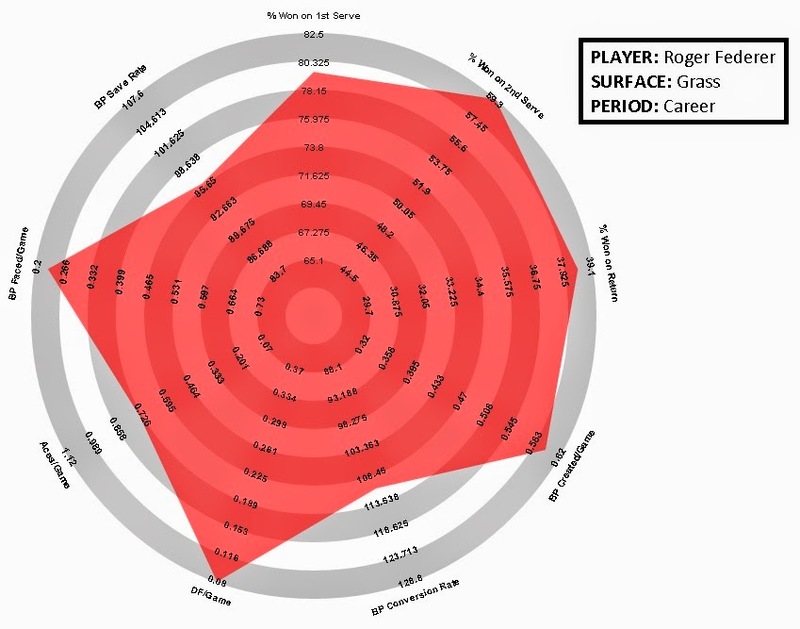 The radar below shows how Mr. ATP Average on grass would appear on these graphics. 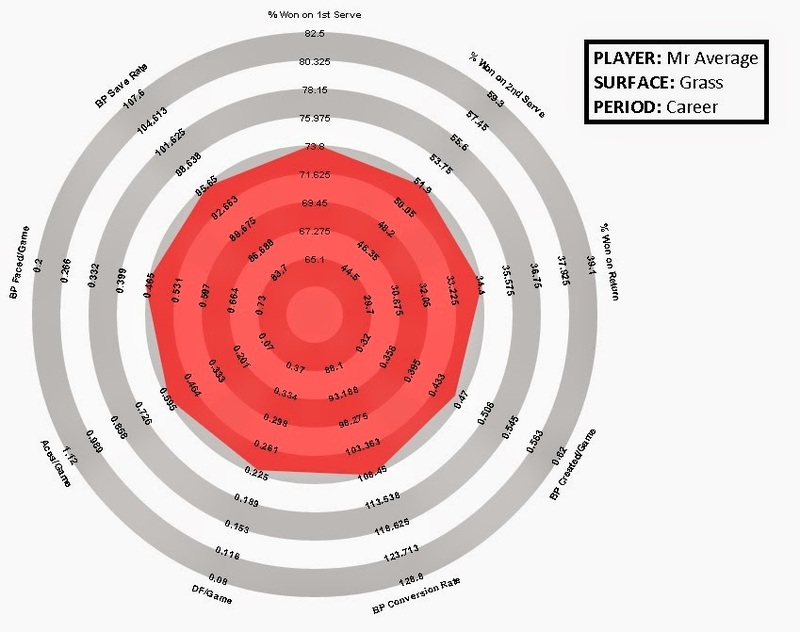 If a player touches the outer ring on any of the statistics, this is equivalent to being two standard deviations above the ATP average, while a player touching the inner-most circle is equivalent to being two standard deviations below the ATP average. The average and standard deviations are based on the career performance of the top 100 players at the end of 2013. Most of the statistics are fairly self-explanatory, although there are two that I will expand upon. The BP Conversion Rate is calculated by dividing the % of break points won by the player's % won on return to determine whether he performs better or worse compared to an average point when he creates a break point on his opponent's serve. A value of 100 corresponds to performing exactly the same, whether it is break point or not, a value greater than 100 corresponds to performing better on break point than an average point and a value lower than 100 corresponds to under-performing on break point. In the same way, the BP Save Rate divides the % of break points saved on a player's serve by the % of points won on serve to determine whether he performs better when facing break point.